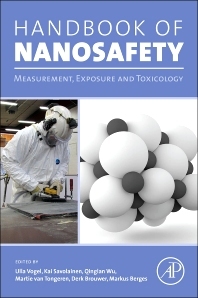 Handbook of Nanosafety: Measurement, Exposure and Toxicology, written by leading international experts in nanosafety, provides a comprehensive understanding of engineered nanomaterials (ENM), current international nanosafety regulation, and how ENM can be safely handled in the workplace. Increasingly, the importance of safety needs to be considered when promoting the use of novel technologies like ENM. With its use of case studies and exposure scenarios, Handbook of Nanosafety demonstrates techniques to assess exposure and risks and how these assessments can be applied to improve workers' safety. Topics covered include the effects of ENM on human health, characterization of ENM, aerosol dynamics and measurement, exposure and risk assessment, and safe handling of ENM. Based on outcomes from the NANODEVICE initiative, this is an essential resource for those who need to apply current nanotoxicological thinking in the workplace and anyone who advises on nanosafety, such as professionals in toxicology, occupational safety and risk assessment. 1.2 What is a Nanomaterial? 1.5 How About the Hazards? Chapter 6. Quality Control of Measurement Devices – What Can Be Done to Guarantee High-Quality Measurements? Kai Savolainen is Research Professor, Nanosafety Research, at the Finnish Institute of Occupational Health. He obtained his Dr. Sci. degree in medicine and surgery from the University of Helsinki in 1981, and his Ph.D. degree in toxicology from the University of Kansas, USA, in 1987. His research covers inflammatory and genetic effects, and risk assessment of nanomaterials. He has served in numerous scientific expert committees, and has led several large research consortia on nanosafety. He also coordinates the EU NanoSafety Cluster, a platform of all EU FP-funded nanosafety projects.